Museum-lovers will appreciate Sea Fortress Suomenlinna and ARTag Gallery. Head to Market Square Kauppatori and Kamppi Shopping Centrefor plenty of shopping. 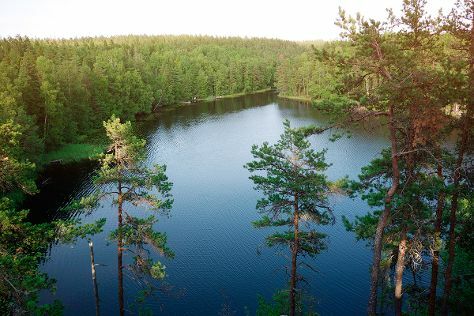 Change things up with these side-trips from Helsinki: Kotka (Santalahti Nature Trail & Linden Esplanade), Teijo national park (in Pernio) and Espoo (Nuuksio National Park & Arctic Expedition). Spend the 31st (Sat) exploring nature at Sipoonkorven Kansallispuisto. There's still lots to do: contemplate in the serene atmosphere at Rock Church, take in the architecture and atmosphere at Helsinki Cathedral, take a peaceful walk through Niivermaki Nature Conservation Area, and appreciate the extensive heritage of The Esplanadi Park. To see where to stay, ratings, and other tourist information, refer to the Helsinki trip itinerary builder app . If you are flying in from United States, the closest major airport is Helsinki Vantaa Airport. In August, plan for daily highs up to 69°F, and evening lows to 53°F. Finish your sightseeing early on the 7th (Sat) so you can travel back home.